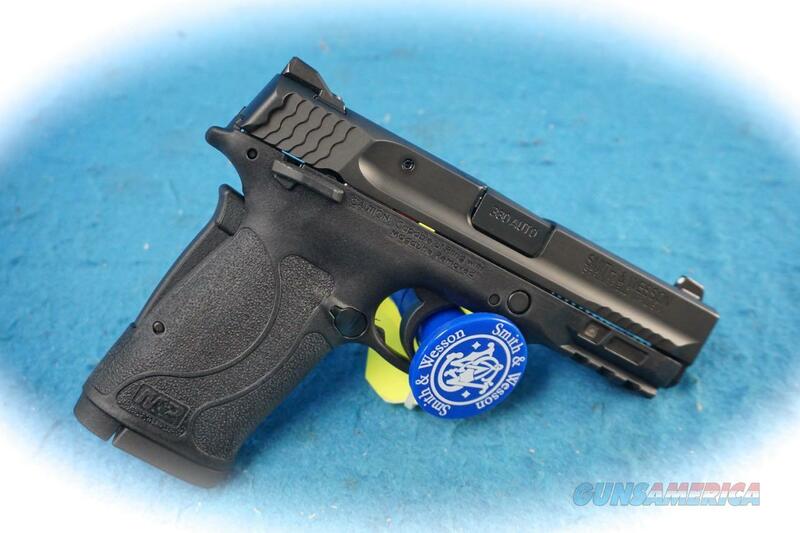 Description: Smith & Wesson M&P380 Shield 2.0, .380 ACP caliber with thumb safety, SKU 11663. Other Features • Easy to rack slide. • Crisp, light trigger with tactile and audible trigger reset. • Includes (2) Easy to Load 8-Round M&P380 Shield magazines. • Grip safety - grip pistol to fire. • Windage adjustable, white dot rear sight (tool included). • Can disassemble without pulling trigger. • Grip texture optimized to size and recoil. • Tactile loaded chamber indicator (TLCI) - can see and feel if there is a round in the chamber. • Available with or without ambidextrous, manual thumb safety. • Picatinny-style equipment rail for lights or lasers. • Perfect size for nightstand or carry, or a day at the range. • Reversible magazine release. • Thin and lightweight - can be comfortably carried all day. • Optimal 18-degree grip angle for natural point of aim. • Armornite® durable corrosion resistant finish.